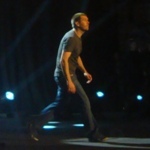 Rhod Gilbert’s performance on Live at the Apollo is probably one of my favourite rants of all time. Clever, energetic and hilarious. Therefore, I was off to Hammersmith for The Cat That Looked Like Nicholas Lyndhurst Tour. The show was to filmed for DVD and to my surprise I had an enormous camera directly behind my seat. Andrew Bird, the support act, warmed up the audience with a witty and polished routine and now everyone was in the mood for the main event. 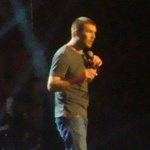 Rhod Gilbert came out all guns blazing. Asking for the audience if anyone was from anywhere exotic, he did a whole routine on Swindon, only to later find out the guy had actually said Switzerland. A new and funnier routine followed, especially as the subject matter seemed tougher to joke about. But it seemed something wasn’t right. He was ranting as usual, but at times he appeared genuinely angry and agitated. I guess the pressure of filming the DVD was probably the cause. After 20 minutes, he decided to take a break for an early interval. A concerned cameraman behind me muttered that wasn’t happy at all, ‘oh he is going off on one backstage’. Apparently, he didn’t seem happy with the start of the show, the way the audience was fully lit up and I guess the stupid decision not to move an members from a packed audience to fill some of the empty seats in his immediate eye line. 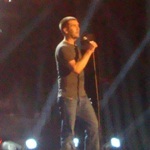 After the break, it was apparent that a much more relaxed and happier man re-entered the stage. Rhod Ghilbert was fully into his routine, comically annoyed at hoovers and washing machines, along with hilarious material on panic and regression. The performance was explosive and the rapport with the audience was near perfection. So much so that members of the audience were requesting for his stage manager to appear on stage just to wind up the comedian, purely for the entertainment of everyone in the building. Off he went, only to come back a minute or so later for additional material to be recorded. Noticing members of the audience had already started to make way for the exits, gave him more ammunition to rant during ‘his encore’. For those that were fortunate to have stayed the distance, Rhod Gilbert performed for another 30 minutes, covering a superbly structured montage of the old favourites including duvets and luggage. Unbelievably, the main highlight of the show was still to come, with the hilarious slide show featuring numerous cats sent into him by ‘fans’, culminating in the final photo that captivated the name of the tour. 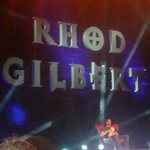 Rhod Gilbert, after a the nervous start, was sensational and with a 3 hour set, made for a memorable evening!